We love this post birth photo featuring maternity pads. 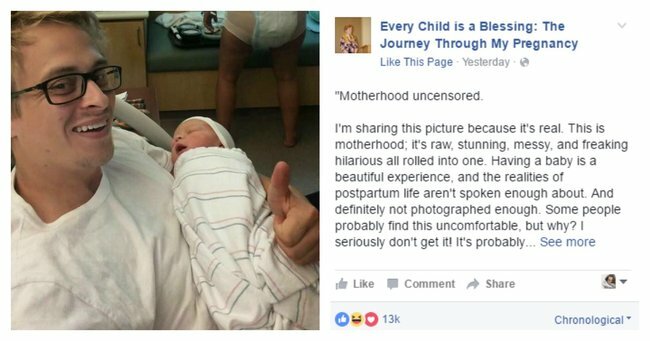 The 'raw, stunning and hilarious' post birth photo that we are loudly applauding. It was in an antenatal class that a midwife used the term “surfboard” to describe the sanitary pads she suggested we pack in our hospital bag. A room full of nervous expectant mothers glanced around at each other. A pad the size of a surfboard? What the hell was going to happen to us after birth, and why hadn’t anyone mentioned this earlier? A couple of weeks later as I was shopping for last minute baby stuff with my sister-in-law, I chucked a bag of maternity pads in my shopping basket. My childfree sister-in-law laughed and threw in four more packets. She told me that her best friend had bled for six weeks after her baby was born. How, HOW had I gotten to 36 weeks pregnant before I learned that not only would I bleed so much I would require surfboards in my undies, but that I would bleed for six weeks? Like most stuff to do with birth and matters related to lady gardens, it’s still all kept quiet and hidden away despite the fact that it’s 2016. And that’s why I am LOUDLY applauding blogger Amanda B from Every Child is a Blessing for sharing this “raw, stunning, messy, and freaking hilarious” photo on facebook. “Nothing says welcome to motherhood like an adorable squishy baby, and a giant mom diaper,” she writes. And I’m not the only one applauding. The photo has been shared nearly 2000 times, and has over 17,000 likes on Facebook. Australian blogger and photographer, Nami Clarke from Little Tsunami shared the photo on Instagram. What other tips and tricks do you have to share with first time mothers?